Viewers of ITV’s The Great Fire, which concludes this week, will have seen the unfolding of a conspiracy theory in which the finger of blame for the Great Fire of London is pointed directly at Catholics. This is not pure dramatisation – there was no shortage of anti-Catholic sentiment in 17th century England, not least because of the events of 5 November 1605. Historian Thomas M. McCoog SJ surveys the religious and political landscape in which Catholics – and particularly Jesuits – became the prime suspects for the Great Fire of London. This unforeseen development the English Jesuits blamed not on the king, whose Catholic sympathies were viewed with suspicion by Anglican clergymen, but on residual English anti-Catholicism. The promises of tolerance made at Breda applied to non-conformists desperately blaming Roman Catholics and exonerating themselves for the turmoil, and to Roman Catholics anxiously demonstrating their devoted royalism. But translation of royal promises into practical religious tolerance depended on Charles’s first Parliament, the so-called ‘Cavalier’ Parliament, which convened on 8 May 1661. Instead of the religious toleration so desired by the king, Parliament passed a series of acts known collectively as the ‘Clarendon Code’ for the restoration and protection of the Anglican Church. These laws, directed principally against Protestant non-conformists for their role in the civil conflict, reinforced Catholic marginalisation. During Parliament’s first session, before the numerous episcopal vacancies had been filled, Roman Catholic gentry and nobility petitioned the House of Lords for relief from the penal laws. They argued that Catholics suffered grievously for their allegiance to the monarchy – although they conveniently overlooked Catholic and papal attempts to reach a modus vivendi with Oliver Cromwell – and that such loyalty made clear that non-conforming Protestants were the real enemy, the true threat, and not Catholics. Some secular clergy under the guidance of John Sergeant (and his fellow members of the ‘Old Chapter,’ an influential vestige of Bishop Richard Smith’s episcopacy after his departure for France in 1631 that was neither recognised nor repudiated by the papacy) replied to Protestant non-conformist defamation of Catholics, by deflecting their accusations of treason and disloyalty from Catholics in general to Jesuits in particular. Consequently they proposed terms for toleration that included the expulsion of the Jesuits. Understandably the Jesuits argued for their inclusion in any tolerance because they too had suffered during the Interregnum, as did their students and their penitents. The defence’s influence was minimal. A committee of the House of Lords discussed possible Catholic relief in the summer of 1661, but failed to introduce any legislation before Parliament adjourned at the end of July. The bishops returned to the reconvened Parliament in November, and attempts to revive the discussion failed. Instead, the following spring, Parliament passed the second act of the Clarendon Code: the Act of Uniformity[x] made use of the new, revised Book of Common Prayer compulsory. Six months later, on 26 December 1662, Charles II’s first declaration of indulgence suspended the enforcement of the Act of Uniformity, and granted toleration. However, the king failed in subsequent attempts to entice Parliament to legislate in favour of tolerance. By March 1663, Charles retreated and rescinded his declaration. Catholics now hoped not for toleration but for the non-enforcement of the penal laws. The expulsion of the Jesuits was still dangled as a carrot. The anonymous author of The Jesuite and priest discovered, or, A Brief discourse of the policies of the Church of Rome (London, 1663), insisted that a Jesuit (unnamed) encouraged antagonism between King Charles and Parliament, provoked a declaration of war, stirred up the ‘Sons of Belial to stain their Hands with his [Charles’s] Sacred Blood,’ exhorted the people to erect a Commonwealth, and then worked for its destruction (p. 11). All in a day’s work! Protestant self-exonerating denunciations of Roman Catholics stirred up a fear of popery that persisted in Parliament and throughout England. Non-conformist ministers reminded the reading public that Catholics were the true enemies. 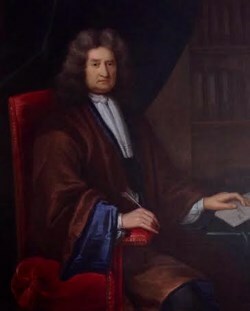 Peter Du Moulin, an Anglican clergyman and son of the Huguenot Pierre Du Moulin, exculpated Protestants in general from the charge of regicide, and repudiated Catholic protestations of their loyalty during the rebellion. [xi] Du Moulin recalled the various plots and conspiracies hatched by Catholics against English monarchs, and highlighted conflicts between Jesuits and various princes. Did any Protestant divine ever engage in such activities? Presumably the answer is ‘no.’ But Du Moulin would not condemn all Catholics because of the antics of a few. Thus he proposed an oath of allegiance similar to the Jacobean oath that would separate the loyal sheep from the treacherous goats. The Great Fire of London swept through the City from Pudding Lane to Pye Corner between 2 and 5 September 1666. The search for scapegoats rounded up the usual suspects. The popular English imagination associated Catholics with fire, from the Smithfield flames of Queen Mary Tudor to the gunpowder of Guy Fawkes. By the end of the year a royal proclamation ordered the banishment of all Roman Catholic priests, and the disarming of all Catholics who refused to take the oaths of supremacy and allegiance. Suspicion of Catholic involvement in the fire persisted and their guilt was later proclaimed in the inscriptions around the base of the Monument, despite the absence of any judgement, in any of the investigations, regarding their responsibility. More specifically, the finger was pointed at the Jesuits. An unnamed ‘Catholick-Christian’ surveyed in considerable detail the inflammatory speech and behaviour of the followers of Ignatius Loyola, whose first name he derived from ignis, Latin for fire. 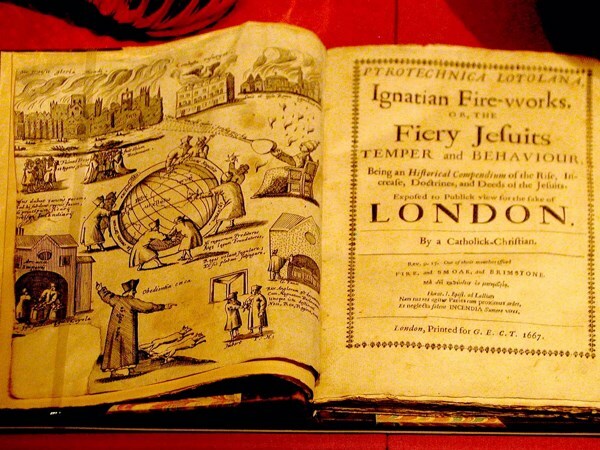 The Pyrotechnica Loyolana, Ignatian fire-works, or, The fiery Jesuits temper and behaviour being an historical compendium of the rise, increase, doctrines, and deeds of the Jesuits (London, 1667) highlighted in capital letters variations on ‘incendiaries’, ‘gunpowder’, ‘fire brands’, ‘fire’, ‘flames’ and ‘burnt’ in his exposition of Jesuit mastery of the art of making and directing fireballs. The Pyrotechnica Loyolana - click here for high resolution. However, the move to exclude James did not succeed. The Catholic Duke of York ascended the throne in 1685; and Charles was reconciled to the Roman Church on his deathbed: ‘Now is the winter of our discontent/Made glorious summer by this son of York.’ Summer ended when the Protestant winds of November 1688 propelled the fleet of William and Mary to Torbay. [i] General Nickel to Courtney (vere Leedes), Rome 3 July 1660, ARSI, Angl, 2/I, fol. 225r. [ii] Richard Barton (vere Bradshaigh) to Nickel, (London?) 2/12 May 1660, published in Henry Foley SJ, Records of the English Province of the Society of Jesus, 7 vols. in 8 parts (Roehampton/London, 1875-1883), vol. 1, p. 231. [iii] 3 James I, c. 4. [iv] Richard Baxter, A key for Catholicks (London, 1659), p. 323. [v] Richard Baxter, Catholick unity: or The only way to bring us all to be of one religion (London, 1660), p. 157. [vi] De Monarchia Hispanica: Thomas Campanella an Italian friar and second Machiavel. His advice to the King of Spain for attaining the universal monarchy of the world (London, 1660). [viii] An Answer to the Provinciall Letters published by the Jansenists, under the name of Lewis Montalt against the Doctrine of the Jesuits and School-Divines (Paris, 1659). [ix] Martin Grene, An Account of the Jesuites Life and Doctrine (n.p. [London], 1661), sig. A 3v- A 4r. [x] 14 Car 2 c 4. [xi] A vindication of the sincerity of the Protestant religion in the point of obedience to sovereignes opposed to the doctrine of rebellion authorised and practised by the Pope and the Jesuites (London, 1664).